For all January has been...well...January, I have had some great fashion discoveries this month that have made days brighter and avoiding the shops more bearable. So here is a little round up of my January loves, hope you enjoy them! Yes that's right! Sarah Jessica Parker has created her own shoe collection, with help from none other than George Malkemus, CEO of Manolo Blahnik! You can really feel the Blahnik influence in the shoes, particularly in the strappier varieties. I think the pair in the picture are my favourites, in both this shade and the dusty pink. You can see the full range here! 2 Chanel Spring-Summer 2014 Haute Couture show "Fashion Machine"
I think of Karl Lagerfeld as a visionary, an artist as well as a designer, and I love his shows. This month's "Fashion Machine" did not disappoint! I loved the hair and make-up, and the fact that a lot of the looks were both fashion-forward yet wearable (the models must have loved being able to wear trainers too, instead of having to totter around in massive heels!). I absolutely adore Cara Delevigne too, and she always looks stunning in Chanel. If you haven't seen the show yet you can watch it here! Okay, I know this one isn't really fashion related as such...but in my efforts to not spend, I decided to keep my treats to a minimum, and took myself off to Lush for a mini haul. I got tonnes of Lush stuff for Christmas (I'm not complaining! ), but I must have had so many baths that I needed a bubble bar top up already! So I bought myself an Amandopando bubble bar and a Melting Marshmallow Moment as a little treat. Amandopando has a subtle yet gorgeous smell, but I'm yet to use the melt, so my verdict will follow later (I promise!). 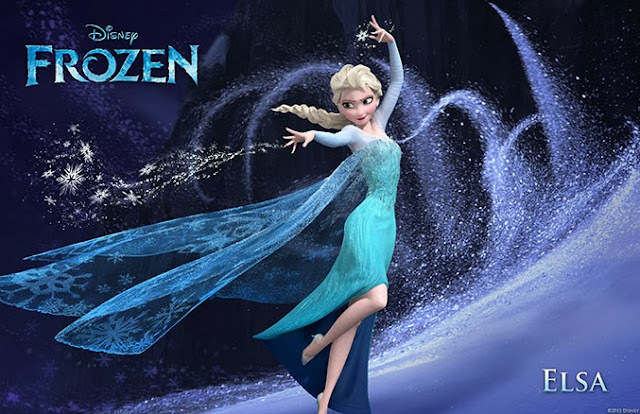 5 Elsa's Dress in "Frozen"
What's been exciting you this January?